Miss Immy's London: Miss Immy Does Vegas! It's strange approaching Las Vegas by plane, peering out of the window seeing nothing but desert for miles and miles and wondering if the pilot has done a wrong turn as we're told to fasten our seat belts for landing. Seriously? There's no sign of life out there, let alone a fully functioning city. Then it appears like a jewel in the desert crown. Viva Las Vegas! And it's even more magical from the air at night with all those dazzling lights. It really is the city that never sleeps. 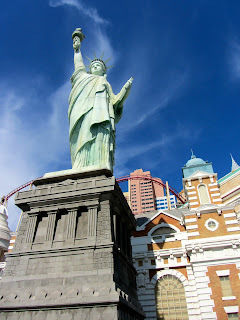 I went to Vegas for a long weekend in September, joined by my friend Chloe. At first, I was worried that going all that way for a 3 day break was a bit ambitious and perhaps we should have planned to stay a week. But it was in fact the perfect amount of time and we managed to well and truly nail it. 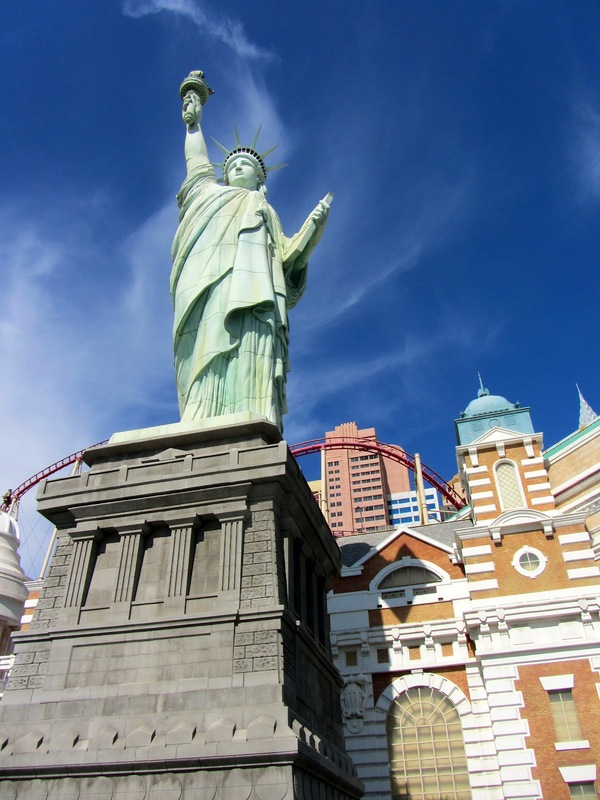 The main focus of Vegas is The Strip which is a 4.2 mile stretch of Las Vegas Boulevard South, heaving with dramatic architecture made up mostly of high rise buildings and ridiculous hotels. It really is a playground for adults. We took a short cab ride to our hotel, The Vdara which is a very new hotel located within the equally new and shiny Citycenter (that's the correct American spelling of centre!) complex. Citycenter is also home to the Aria Hotel and Crystals Shopping Centre full of high-end posh shops and has a natty little monorail service which is free and an ideal way for guests to get around. The Vdara prides itself on being an eco-friendly, non-smoking, casino-free hotel comprising of suites only. 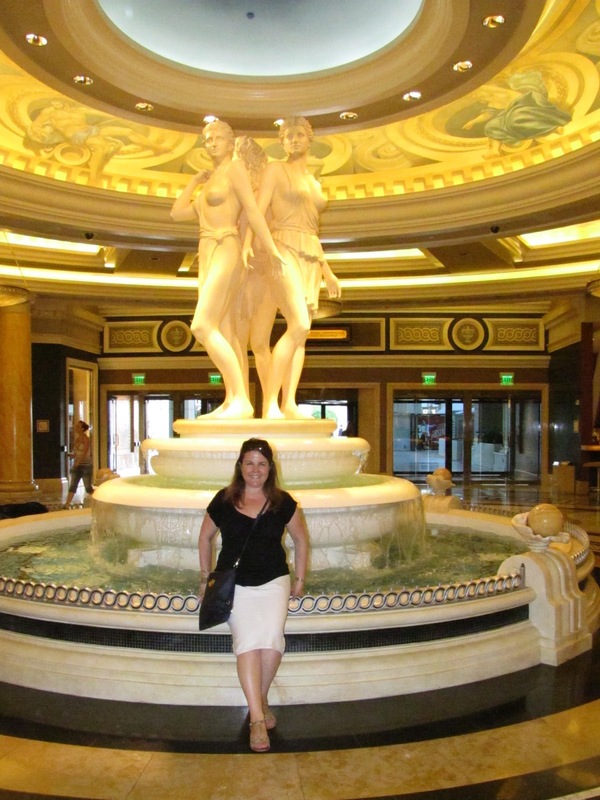 In Vegas-standards, it's actually quite small and was a perfect retreat to relax and escape the hustle, bustle and casino-chaos. The suites are tastefully decorated with state of the art features and a kitchenette which even though they state as being 'fully-fitted', I must disagree as there wasn't a plate, cup or spoon anywhere to be found. The service (as with everywhere in America) was first class, with helpful, friendly and attentive staff who literally couldn't do enough for you. I know some may find the 'Have a nice day' approach a bit annoying sometimes, but I seriously think our service industry could learn a thing or two from our Stateside pals. The Vdara has not one, but five swimming pools, some are just plunge pools, but when it's 35 degrees outside, plunging is good. There's also a spa where you can retreat for a massage once you've blown all your cash on the slots! Venetian canal complete with gondolas. But don't be fooled by that sky. Our 3 day stint kicked off on a Thursday evening and went something like this... Once we'd checked in, dumped our bags and found our bearings, it was time to explore. Our hotel was literally next to the Bellagio Hotel (yes, that one from Ocean's 11), so we went to check out the infamous dancing fountains which were just as magical in real life. Almost like aqua-fireworks, dancing to the beat of Frank Sinatra, and stunning both by day and by night. It's thirsty work in the desert, so we soon found an oasis in the form of a bar where we sank a couple of cocktails before heading to one of the many restaurants at the Bellagio for a bite to eat. Before long, jet-lag had kicked in to the point where it was time for a much needed kip. Friday was a mammoth day where we literally walked the entire length of The Strip, darting in and out of nearly every hotel along the way, partly because the walkways are cleverly engineered in a way that you have no choice but to end up in some of the hotels, as in Vegas they are all part of the attraction. There's the New York, New York hotel styled on the infamous New York skyline complete with replica Empire State Building, Statue of Liberty, Brooklyn Bridge and a mini rollercoaster. The Paris Hotel feels very ooh-la-la with a huge replica of the Eiffel Tower plonked outside. 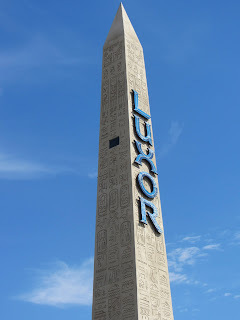 Then there's the Egyptian-themed Luxor Hotel built in the shape of a giant pyramid with an equally giant Sphinx and obelisk. 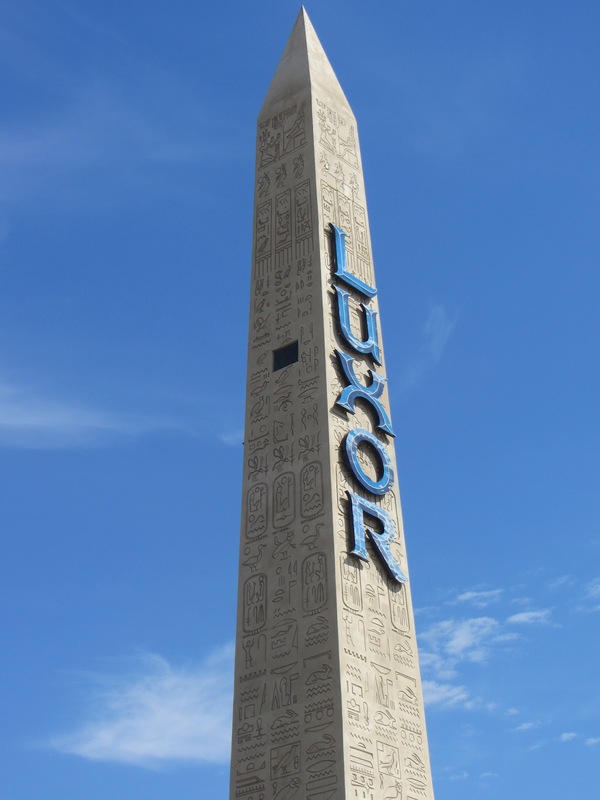 Due to the slanted walls of the pyramid interior, rather than having lifts inside the hotel, guests have to take 'inclinators' which are like lifts. But slantier. The MGM Grand is one of the original hotels and even though it's quite dated on the outside, its interior is still as opulent, vast and glitzy as you'd imagine. 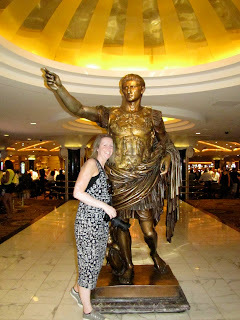 Then there's Caesar's Palace which is vaster than vast and oh so shiny and OTT inside. But perhaps not quite as bonkers as The Venetian which was one of my favourites. A hotel literally made to feel as if you've arrived in Venice, full of canals complete with real gondolas (only for the really desperate tourist), and a miniature St Mark's Square accommodating a shopping mall. The sky is incredibly realistic as it's been painted by professional set designers who create such backdrops for films, and together with the adjusting sky lighting, it really is easy to believe you're outside in the heart of Italy. Not inside a gimmicky hotel in the heart of the desert. Vast is a word I associated a lot with Vegas. Everything is vast. Most of the hotels comprise a shopping mall of sorts, as well as casinos and restaurants, so each one feels on a par with Wembley Stadium. And some of the hotel lobbys alone are so vast, they could comfortably accommodate the Vatican. Well, almost. Portion sizes are vast and almost off-putting. Brunch is all the rage in Vegas and a perfect way to set you up for the day. 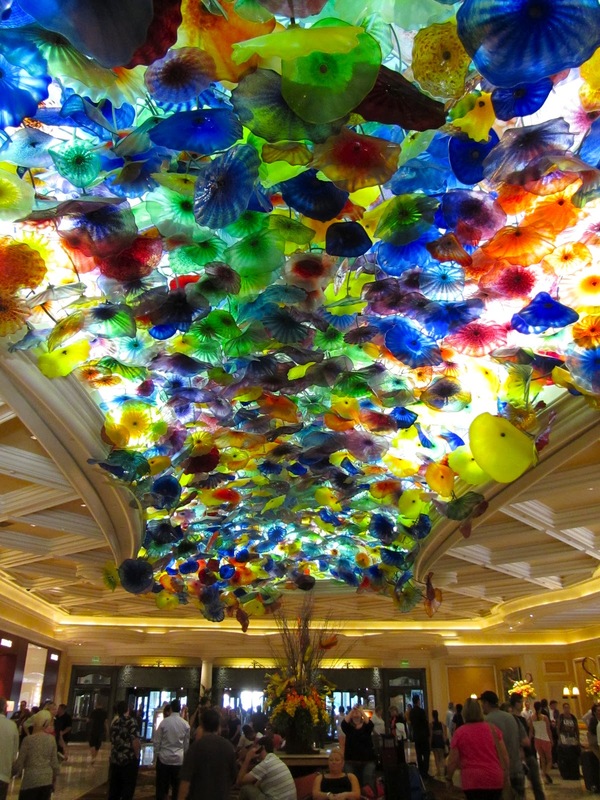 One of the most popular being the Bellagio Brunch which is literally a feast for sore eyes as you're confronted with the choice of bacon, eggs, steak, pizza, sushi, stir-fry, jambalaya, waffles, crayfish, cheese platter, donuts, Caesar salad and fruit. I've never seen such a ridiculous amount of choice in one place. Where on earth does all that food come from in the middle of the desert, that's what I want to know. It's no wonder Elvis loved Vegas so much! 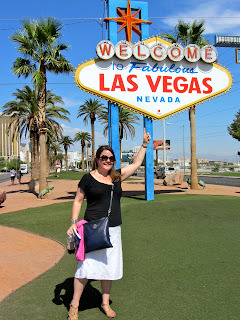 As well as taking in all the crazy hotels, we also wound our way to the infamous 'Welcome to Fabulous Las Vegas' sign at the far end of The Strip which was erected in 1959 and is still a star attraction. 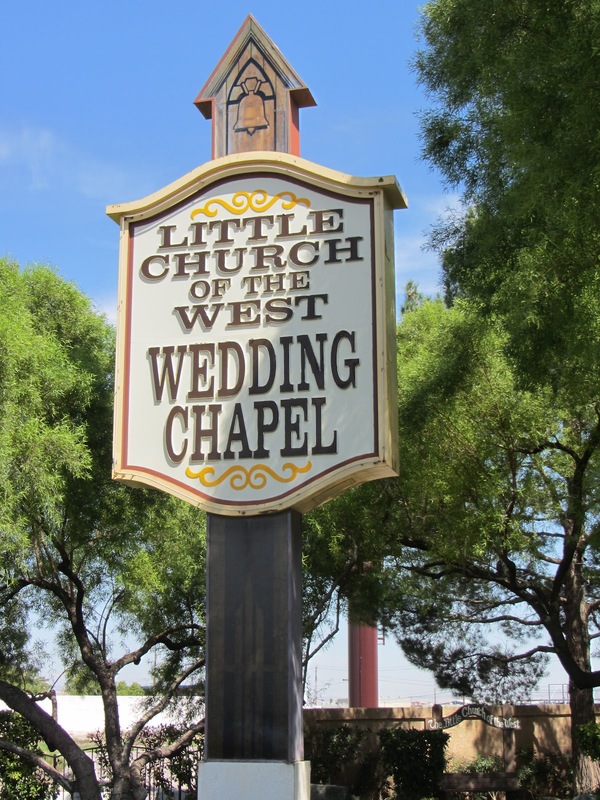 Nearby is 'The Little Church of the West', a quaint wooden wedding chapel built on a perfectly manicured lawn with pretty trees full of fairylights. And surrounded entirely by a giant highway. A wedding was in progress when we were there, so I gave the newlyweds a congratulatory wave although it didn't feel like a real wedding. Nothing in Vegas feels real. 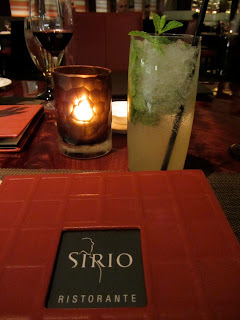 With weary feet it was time to return to the hotel for a quick rest and change, before heading out for dinner at 'Sirio' at the nearby Aria Hotel. The food here was excellent and a far cry from the usual exaggerated American-fare. Top notch Italian cuisine, Chloe and I enjoyed butternut ravioli with truffle shavings; beef carpaccio; perfectly cooked lamb cutlets; homemade pasta with beef ragu; chocolate souffle and fine wine. This was without a doubt the best meal we encountered in Las Vegas and if you want a break from steak, then I highly recommend it. Feeling full and happy, it was time to try our hand at gambling, so off to the Bellagio casino we went to give the chips a whirl. Casinos are a curious place and gambling is a strange game. Old dears sitting at slot machines, clutching their handbags, smoking their heads off and ploughing all their cash into these lean, mean fruit machines. On the Blackjack, poker and roulette tables, players from all over the world united in gambling knowledge and a secret international language full of knowing glances and discreet nods. Chloe and I had absolutely no idea what was going on and giggled nervously into our mojitos as we attempted a flutter on the giant wheel. I attempted a turn on the roulette table, but at $10 a pop, decided to purchase just 2 chips which looked so pathetic compared to my fellow players' giant chips stash. Unsurprisingly, I was out within a matter of minutes. We decided our safest gambling bet was to just watch! Quite fascinating studying players feverishly placing their chips with such deft confidence and apparent know-how. Some losing hundreds, if not thousands of dollars in one fell swoop. Whilst others hit the jackpot time after time. You have to be over 21 to gamble (and drink) in the USA, so I felt like a real winner when asked for my ID, not once, but twice that evening. Kerching! Saturday was a more low-key affair with the morning spent mostly by the pool and a spot of shopping in the afternoon at Caesar's Forum which is full of real shops for real people. That evening we dined at Nine Steakhouse at the Palm Hotel which was highly recommended by several people, but I personally found it quite disappointing and lacking in atmosphere. The Ghost Bar upstairs at The Palm however is definitely worth a visit as it affords excellent views across the city by night. Then it was time for a show. No trip to Vegas it complete without a show and as Cirque du Soleil seem to monopolise the show front with one at pretty much every hotel, we booked ourselves tickets to see 'O' at the Bellagio. The show was full of clever signature Cirque du Soleil circus performances based entirely around a deceptively deep pool and was completely beautiful and mesmerising. Sunday was soon upon us and before heading to the airport, Chloe and I decided to end our trip with another 'only in Vegas' moment. Gospel Brunch at the House of Blues. Where else in the world can you tuck into bacon, eggs and fresh orange juice at 10am on a Sunday, in a dark seedy blues club whist being entertained by a fantastic gospel choir singing their hearts out? It was absolutely bonkers, but I loved it. Praise the Lord! It must have been especially wonderful to have been in Vegas in the days of of Frank, Sammy & Dean, I'd love to have seen it then. 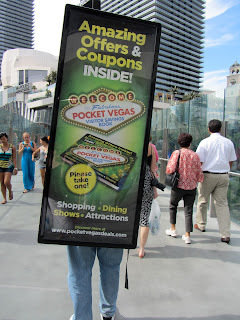 And if I had stayed a little longer, I would have headed Downtown to check out Fremont Street, the Golden Nugget casino and the Neon Boneyard for a taste of old, nostalgic Vegas. 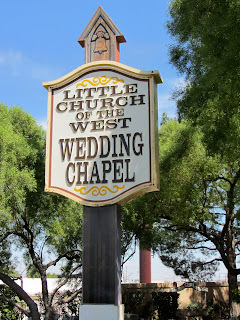 Perhaps with a little helicopter ride over the Grand Canyon thrown in for good measure. Oh and a night at The Wynn which in my mind, is the best hotel in Vegas. I thoroughly enjoyed Miss Immy's adventure to Las Vegas and I'm so glad I've been as it's definitely one of those places you should experience at least once in a lifetime.